Having been blessed with superb weather yesterday, and no cycling due to life's other commitments, all the 'I didn't get to cycle' guilt was blown away on a Mountain, on a bike in the sunshine. My other kind of cycling, is being on my mountain bike and going with the girls. 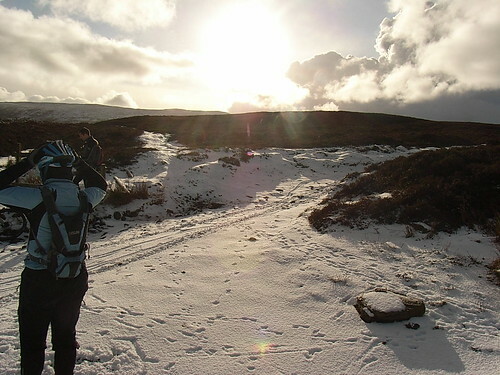 The island has superb mountain access with a range of different trails, tracks and routes all off road. 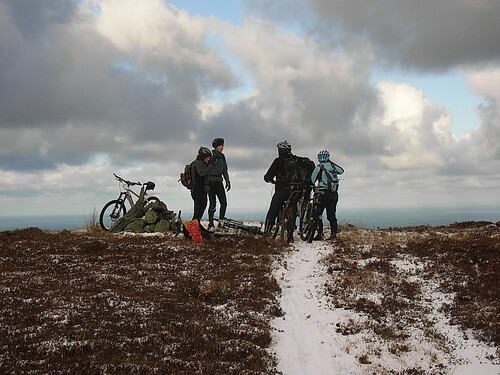 I am a member of the Manx Mountain bike club, having joined the group last April – simply to be social. You see, thats the thing about road cycling especially Audax like riding. Where I live, we produce some of the worlds best cyclists – Mark Cavendish and Peter Kennaugh to name just two... But unless you want speed and ride on 23 mm 700 c tyres, there isn't a lot of social riding for us slower road cyclists. So, long distance riding I tend to do alone. To broaden my social horizon with like minded folk, I started last year to look for cycling groups who go out and about in a group, and who visit tea shops frequently.... 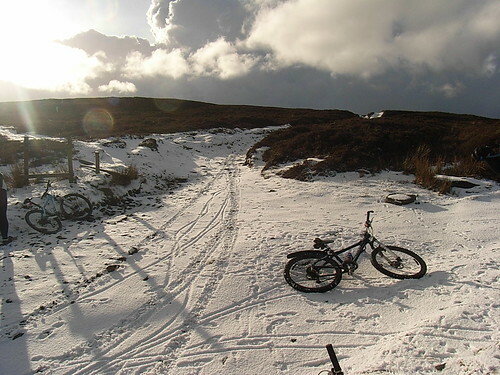 Thus, I was recommended the Manx Mountain Bike Club firstly from a local bike shop, and seconded by my other half who thought I would really get on with riding off road. They happen to have a ladies section. So last summer I went out on a Monday evening with them, and when my fitness improved, I doubled the effort by riding out on a Sunday morning as well. The Sunday morning rides are for those riders who are able to cycle for at least 3 hours off road. The ladies group is not of course not testosterone driven and we wait for one another, help with punctures when they occur and share our cycling stories.... I must admit by increasing my cycling to both off road and on road, has really improved my fitness and weight loss. I find the two cycling disapplines compliment one another very well indeed. Miles and miles out and about alone on my touring bike means I can cycle miles and miles off road. The off road cycling, has improved the milage and distance on the tourer. I must admit, I have gotten rather good at hill work too, so long as its the up hill kind, I do lean too hard on brakes when going downhill on a mtb though. So, to today. we were supposed to meet on the Mountain at the Black Hut this morning, but I was awake at 5am (See how the excitement of the MTB rides grabs me!) it was snowing. This meant the Mountain road was closed and so no access to anyone. Instead we met at Shoprite car park in Ramsey for a middle island ride over the hills and tops. A distance of 14 miles, about 12 of which were all off road. We set off and up Sky Hill. Here we are having a wee rest part way up it. I hadn't ridden parts of this particular route before, it was very beautiful and serene – not a single bird was calling and off course NO TRAFFIC. Another shot just before we set off again, the weather was very dramatic, last night neither the Northern aspect or the Southern received any snow, just the middle bit over the hills, ideal really, as apart from the Mountain Road being closed, no one was really affected by the white stuff. And yes, we had to cycle down this lot.... I like hills, cept I prefer them upwards. When we started to traverse down this little lot, it was the STEEPEST decent I had ever done. I was right off the back of the saddle sitting almost on the rear wheel. Scary stuff indeed, the hill seemed to curve away beneath us.... Amazing views, much better to see them in real life. Had a brilliant day out, last Sunday we had another fabulous day in the pouring rain though, and so no photography as my camera is not water resistant. And tomorrow is yet another first, because I have lights now suitable for night time riding and we all meet tomorrow at the 'Cat with No Tail' for my first night time cycling experience off road. I have entered the Manx End to End Challenge again for September this year – entries are nearly full for this fabulous cycling event if you know someone who fancies a 40 mile off road experience on their bikes. I failed to get to the finish line last year, maybe this year will be different. Hope you liked the pics. Posted by Mary on January 31st, 2010. I got out today among a little bit of snow. Took some pictures, but yours are so much nicer so I might not do anything with mine. 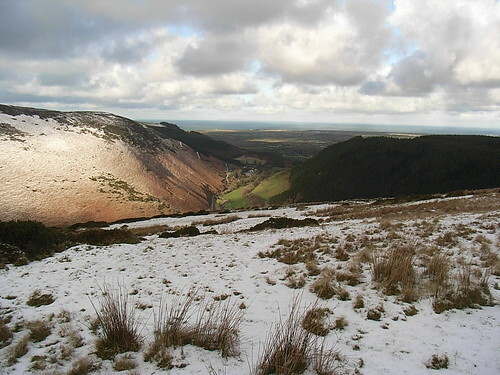 If the Manx End to End was a couple of weeks earlier I'd have been tempted to take my Ridgeback over and see some of this beautiful scenery for myself. Oh, I see entries for 2010 are closed, at least for now. Still, I suppose I could have a go anyway. Some of us chaps who did the Yorkshire Three Peaks last year are up for a challenge with a difference. The pics look great – love those clouds. The weather you had was the same as here, just across the water. My first 25 years of regular cycling was on a mountain bike. It was in 2008 that I got my first road bike, although by then I was riding my MTB mostly on the roads anyway. I don't much like anything too technical since I fell off in the Peak District and had amnaesia after getting knocked unconscious. I do tend to lose my balance quite easily. I fell off my MTB last year and went head first into a pit of wet peat trying to keep up with my son, and came out completely black. I do enjoy offroad tracks though, like those in those pics. And I think it's true that stop/start cycling offroad is not exactly the same kind of physical effort as on the road – it tends to expand your fitness band a bit like walking or running do. I must say Mary's posts are an excellent advert for the Isle of Man. It always looks lovely in the photos. Chris, dont be put off by the 'closed' notice for the End to End. Contact organisers if you are keen, and get on the waiting list. Last year, they had approx 200 non entries on the day due to folk putting in an entry very early and personal life getting in the way, so its always worth going on the 'waiting list'. Ouch Patrick! That didn't sound nice. I am a bit of a scardy cat when it comes to falling off. I tend to ride wiht one foot clipped and one unclipped, for some reason I have told my brain this is a good idea.... Likely it isnt. Good post. I like it! We've had no snow for about 10 days.